Mercer Museum hosting National History Day Regional Competition at DelVal - Times Publishing Newspapers, Inc.
First-place winners who are seniors will have a chance to qualify for DelVal scholarships worth up to $25,000 annually. National History Day is an annual academic enrichment program for students in grades six through 12 that encourages thoughtful historical research, project-based learning and a dose of friendly competition, as individuals or as a group, in one of five distinct categories: exhibits, papers, websites, documentary films and performances. More than 175 students from Bucks and Montgomery counties participate in the regional event, and regional winners move on to the state level competition. Guided by an annual theme, students are encouraged to choose a topic that matches their personal interests. The 2019 theme is “Triumph and Tragedy in History,” and allows middle and high school students to take history beyond the classroom. The University will offer Presidential Scholarships to the first-place winners in the senior individual exhibit, the senior documentary, the senior website and the senior paper categories. The Presidential Scholarship is a merit award that is based on past academic achievement and encourages academic success and rigor at the University. The scholarship is worth up to $25,000 annually. To qualify, winners must be high school seniors in good academic standing, apply, be offered admission and enroll at DelVal in the fall of 2019 meeting all stated criteria as first-time freshmen students. Eligible students will be required to show proof of their achievement in the competition at the time of application. Students are eligible for one academic scholarship at the University. A student will be granted the highest of any offer of institutional merit scholarship. For more information, visit mercermuseum.org/national-history-day. 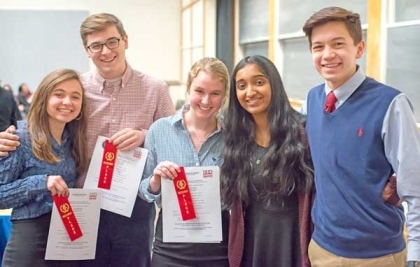 PHOTO CAP: Sophia Rubin, Shreya Babu, CJ Oravec, Sarah Angelo and Gabriel Wingert were the second place Senior Group for their project “The Rwandan Genocide: 100 Days of Silence” in last year’s National History Day Competition.